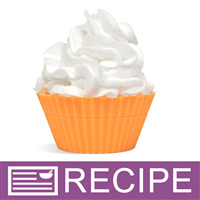 This soap frosting can be used to decorate soap cupcakes, bath bombs, etc. Use your imagination to come up with different ways to enhance your products. Ready to package within 24 hours of making. Add 1 lb. of cut up white soap to microwaveable mixing bowl. Heat in microwave in 30 second increments until completely melted. Add Foaming Bath Whip and gently stir. Heat glycerin and myristyl myristate in measuring cup until completely melted. Whip soap mixture and slowly add glycerin mixture while continuing to whip. Whip entire mixture, scraping sides occasionally with spatula. Once product starts to thicken slightly, add fragrance oil and blend until incorporated. When frosting just starts to thicken enough to hold its shape, turn off mixer. If necessary, place in fridge for 10-15 minutes to cool and thicken. Using a pastry bag with desired decorating tip added to it, fill with soap frosting and decorate the top of each soap cupcake. If desired, add sprinkles, glitter, etc. at this time. Let product sit for about 24 hours to completely harden. Your soap will then be ready to package. Should your frosting start to harden up a bit before you have finished piping, reheat and whip slightly with hand mixer to soften it. NOTE: To color your frosting, add small amount of liquid dye after adding fragrance. Liquid dye can thin out product if too much is used. Powder dyes can also be used. NOTE: Unused product can be kept in air-tight container for up to 12 months. When ready to use, warm slightly in microwave and whip with hand mixer to desired consistency. NOTE: On 3/28/19, Myristyl Myristate was substituted for the Palm Kernel Flakes. Either ingredient can be used in the same amount. Ingredient Label: Sorbitol, Propylene Glycol, Glycerin, Water, Sodium Laureth Sulfate, Sodium Cocoyl Isethionate, Stearic Acid, Lauric Acid, Sodium Hydroxide, Myristyl Myristate, Sodium Chloride, Fragrance, Titanium Dioxide, Diazolidinyl Urea, Iodopropynyl Butylcarbamate, (color if added). "Can Palm Kernel flakes substitute for the myristyl-myristate? I liked the original recipe and worked well, but can’t remember what was in it. I tried this recipe with Stearic Acid and it didn’t harden. Thanks"
Staff Answer You can use the Palm Kernel Flakes instead of the Myristyl Myristate in the same amount. We found the Myristyl Myristate worked the same and was a good substitute for people who do not want to use palm oil. Either of these ingredients should work fine. "Hello, do you need to spray alcohol on soap (MP or CP) to make it adhere to soap? Don't want to put on top of soap and it falls off! thanks"
Staff Answer When using the foaming bath whip you do not want to spray the soap before placing on the soap. The rubbing alcohol will cause the foaming bath whip to slide off the soap and not stick. It adheres great on its own. "Would I be able to reheat and remelt this recipe? I'd like to make a few scents at once but it dries so quickly. Maybe if I added the palm flakes last?" Staff Answer Yes, you can. This is actually stated at the end of the recipe. NOTE: Unused product can be kept in air-tight container. When ready to use, warm slightly in microwave and whip with hand mixer to desired consistency. We do not recommend adding the palm flakes at the end. "Tried this recipe with high hopes. It remains sticky and doesn't produce any bubbles whatsoever. What can I try to get it to not be sticky and/or bubble?" Staff Answer We are very surprised this does not produce any lather as it is a combination of two soap products. You can try adding an additional 0.25 oz of Palm Kernel Flakes if you find it sticky. You will need to work with the product more quickly as this will harden faster. "Can I use Palm oil instead of flakes?" Staff Answer We have only used the Palm Kernel Flakes and found them to work very well. We do not feel the Palm Oil would work as well but you can certainly test it. "Can I use Debbie May's Best Soap Frosting on cold process soap as well as melt and pour soaps? I was wondering if it would bond to CP OK."
Staff Answer This frosting will work on either MP or CP soap. "What can be substituted for the palm kernel flakes?" Staff Answer We have found this ingredient works best in this recipe. It keeps the product soft enough to pipe but then hardens to where the products can be packaged. You can try substituting soy wax in the same amount but we recommend testing this to ensure your product performs correctly. "The kit comes with a Lotion Bar Additive but the recipe does not call for it. Do I need to add it to use my frosting for bath bombs?" Staff Answer We have updated this kit for the soap frosting. The lotion bar additive has been replaced with palm kernel flakes. This matches the recipe for this product. We apologize for any inconvenience this may have caused you. "Can you use this recipe to make a whipped soap loaf? Or can you just use the whipped soap base for a loaf? If just the base how many days til you can unmold to cut? I made a loaf with just the base and on day 3 and not ready to unmold I dont believe but I am very new to soap making so any help is appreciated. Thank you, Lindsy"
Staff Answer The Foaming Bath Whip, which this soap frosting is made with, is not meant to be used to make a solid bar of soap. This is a soft soap that can be whipped for a shave cream, made into soap frosting (with other additives), etc. You want to use the MP (Melt and Pour) soap based to make a solid soap bar. "If I were to add stearic acid to harden soap frosting how much would i add?" Staff Answer This recipe has been designed using the palm kernel flakes which will harden the frosting. The added glycerin will keep it soft enough to pipe on the soap cupcakes. You will have to test adding the stearic acid. We cannot tell you how much to add without completely reformulating this recipe. "Why are there questions about lotion bar additive when it's not listed as an ingredient or mentioned in the directions?" Staff Answer This recipe has been updated a few times since it was originally created. It was previously made using shea butter and Smooth & Creamy Lotion Bar Additive. That is why these questions or on the recipe. "I need to make frosting like ASAP for my M&P Cake Soap order and I thought I had it figured out in my mind but it made me look like a fool. I don't have the Smooth &Creamy Lotion Bar Bar Additive, can I sub Beeswax since it's a derivative and if so how do I figure it. Plz help. Thank You, Sandra"
Staff Answer We do not recommend using beeswax instead of the Lotion Bar Additive. The same amount of beeswax might harden this before you are able to pipe the frosting. This recipe was designed with these exact ingredients to keep the frosting soft enough until piped and we cannot guarantee any substitutions would give the same results. "Will this recipe dissolve quickly in water? I would like to use it for cupcake bath bombs and drop the whole thing into the tub." Staff Answer The frosting will actually float on the water and can be used as soap. 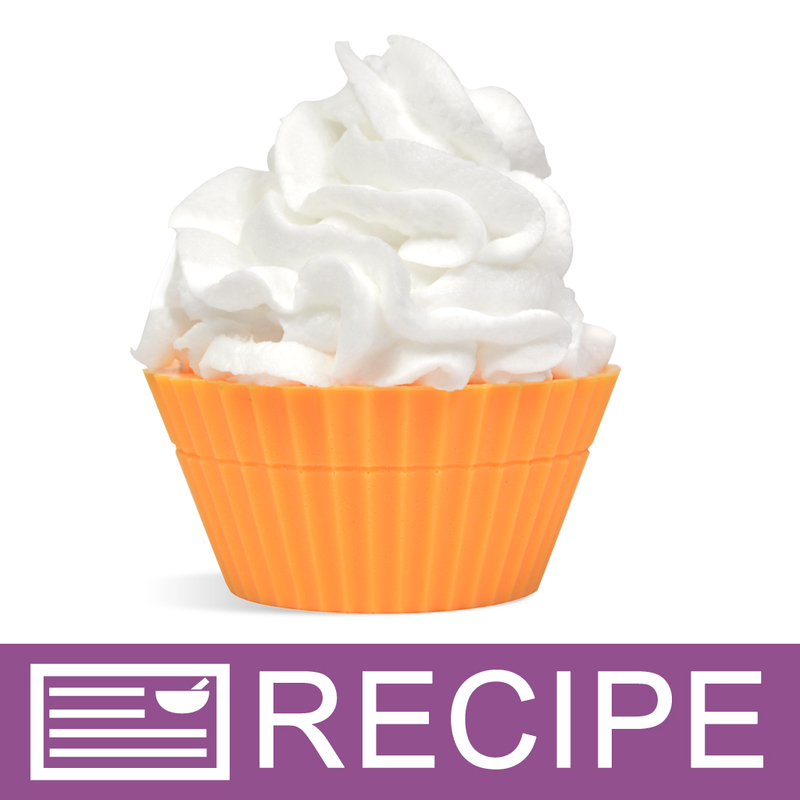 We have used this soap frosting on many bath cupcake recipes ourselves. "Will this soap frosting get as hard as soap? Can it be made to get as hard as soap? " Staff Answer The frosting will not get as hard as soap. You can play around with adding more Smooth & Creamy Lotion Bar Additive but the product needs to stay soft enough for it to be piped. If adding too much of a hardener, it will harden up too quickly and make it very hard to use. "I am not seeing shea butter as part of the recipe. Is this recipe posted some where else where shea butter is added?" Staff Answer The original recipe did include shea butter. This has since been substituted out for the Smooth & Creamy Lotion Bar Additive. This ingredient helps harden the finished product so it can be packaged. "Tried a half recipe several days ago, and it still won't harden up. Grrrrr"
Staff Answer The soap frosting will not completely harden. It will have a firm spongy feel when finished. You could try omitting the Shea butter or replacing it with cocoa butter. "I'm looking for a sugar-free frosting for my cupcake bath bombs that will harden enough to package and ship, but are oil-free to avoid causing slippery tubs and showers for my customers. Will this recipe work without shea butter and glycerin? If the shea butter and glycerin are required, is there an oil-free substitute for both of them? " 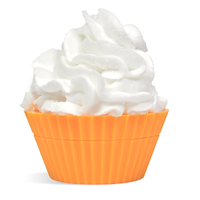 Staff Answer Hi Joy - Shea butter helps harden the frosting, and glycerin helps with the texture to ease piping onto your soap or bath fizzy cupcake. You could try eliminating those two ingredients, and adding a bit more MP soap to help with hardness. It may be more difficult to pipe, and you may have to work quickly. We have not tested this substitution, and cannot guarantee its success. If you decide to experiment, please keep us posted with the results. "Will this recipe become rock hard? If not, what can i add to make the frosting very hard?" Staff Answer Hi April, the frosting will get hard enough to package. It may take a few days to harden and the temperature and humidity may affect your results. If your frosting does not firm up you can re-melt it and add either beeswax or stearic acid to produce a harder soap frosting. "can you do a video"
Staff Answer Hi Miriam - I will pass on your request to our videographer for consideration. Thanks for your feedback! "Is there any way to make this Icing thicker? It is too watery. Maybe it is too warm? I put it in the fridge to try and harden it a bit"
Staff Answer It sounds like it is too warm. The cooler this recipe gets the thicker it will become. You can try adding more of the solid ingredients such as the MP Soap Base or the Shea butter to thicken it if cooling does not work. "Will Detergent-Free 3-Butter Bar work as the white melt & pour soap for the Soap Frosting recipe?" Staff Answer Yes it will. "Can you use clear M&P for this frosting? Also, how much stearic acid would you recommend for this recipe to harden the frosting if necessary?" Staff Answer Yes you can use a clear MP base for this recipe. Stearic Acid is recommended for soaps at 3%. We recommend testing all substitutions in a small batch before making a larger batch for retail. You alone are responsible for product and recipe testing to ensure compatibility and safety. If selling, you would need to change the INCI ingredient listing to reflect any substitutions or changes to our original recipe. "Will this work just as well with unrefined Shea Butter?" Staff Answer Yes, it should. Unrefined She Butter may have a stronger odor and may be more yellow in color causing a slight change in the look of your finished product. larger batch for retail. You alone are responsible for product and recipe testing to ensure compatibility and safety. If selling, you would need to change the INCI ingredient listing to reflect any substitutions or changes to our original recipe. "I made 1/2 of the receipt and it harden up to point that I could not use it. Not sure what I did wrong. It started to harden as soon as I started mixing on low and I could not get a useable consistency. Can I save my batch?? " Staff Answer Try heating your frosting in the microwave in 30 sec. bursts until it softens. You can then add liquid glycerin if it is still too stiff. "I just bought this and then wondered, Will this get firm or will it stay soft like frosting? I want to frost bath bomb cupcakes with it and don't want it to smash or dent..thanks"
Staff Answer Once you frost your product, let it set for about 24 hours and the frosting will harden so it can be packaged.